Residents of Burbage Road are proudly commemorating the life of Richard Burbage – one of England’s greatest actors and close friend of William Shakespeare – with a series of activities throughout the year. Burbage dominated Shakespeare’s roles in a swaggering style imitated by many. With a fantastic dominating voice he captivated audiences. Full details of Richard Burbage’s life and the commemoration 400 years after his death are on the dedicated website. The meeting discussed how to move forward and make Dulwich a better place to live. Southwark Council’s Cabinet Member for Environment, Transport Management & Air Quality, Richard Livingstone, plus Village Ward Councillors and experts on the health effects of traffic related air pollution took part. The possibility of the Croxted Road Controlled Parking Zone (CPZ) being extended was raised. This has yet to be consulted upon but a request has been made to Lambeth and Southwark from Residents in Croxted Road, who find it difficult to park near their houses, for the existing CPZ to be extended. At present it runs up to the petrol station from Norwood Road. The extension is likely to take it past the Turney Road junction. Lambeth and Southwark have to agree to run a consultation but it has not yet been confirmed nor whether Turney Road will be included in the consultation. The other roads that join with Croxted Road i.e. Guernsey and Hawarden Grove were included when the existing CPZ was created. How much any extension will impact on Turney is not known but there may be some displacement onto Turney on both Lambeth and Southwark sides. The latest status of pollution for the local area can be found at http://www.londonair.org.uk/LondonAir/Default.aspx and there is a phone app. The meeting highlighted that this invisible pollution is being found, through research, to be impacting on the elderly and young and it reduces lung capacity. It may account in part for the increase in asthma. It was stated that the level of pollution is higher when inside a car than outside. When walking and cycling it is preferable to avoid busy streets and walk on the side away from the traffic. The amount of pollution at the height of children in buggies is reported as higher than for adults. Comments made included parked cars/school coaches running their engines (which is illegal), the green screening of Schools or closing roads with Schools in them at drop off and pick up times e.g. Bessemer Grange and the lack of bus services through the village. Many comments were made about the through traffic in Dulwich and the potential of electric cars to reduce pollution if not the number of cars. At a well attended AGM of both roads residents celebrated the many activities of 2018 undertaken by active residents and noted changes in the streets. Councillors from Southwark attended as well as a member of our local police team. Throughout 2018 residents were represented on a number of public consultations; working with Dulwich Village Forum and the Safer Neighborhoods Panel; supporting Safe Routes to School in the installation of a new crossing at Half Moon Lane, and encouraging good communication with The Dulwich Estate. Residents helped support charitable and sociable initiatives including the Learning Hub Campaign for St Christopher’s Hospice, volunteers for St Barnabas, Abbeyfields and Bell House and carol singing in aid of School Home Support. No party was held this year as a great deal of work has been going in to a special celebration for next June. Tessa Jowell MP, Cllr Toby Eckersley, Len Bishop and John Ward, were amongst cherished friends lost this year. During the year Southwark council carried out the Quietway Turney Road changes though Lambeth council is still to decide on its implementation plan. There was continuing liaison with the three Sports Clubs, SCST, Dulwich and Edward Alleyn. School child mugging: Muggers on bikes have been targeting children and are not the usual known gangs. There has also been some Inter-school fighting involving a weapon and a slight wound was inflicted. Police have this in hand. Burglaries: May was bad but levels have been lower recently. Car Theft: All attempted thefts and cash lost from cars should be reported. Ap known gang tries car doors in the early hours and have been caught. Fireworks: Residents have complained that Belair House and others, let off fireworks late at night. PC Bush reported they need a a special party license to do this. Resourcing: We value the knowledge and contact point of a local team. Dulwich Village currently has two PCs (Bush and McLynn) but PC Support Officers are not being replaced. PCs are occasionally taken off the area to work elsewhere. We are urged to always report a crime. If it is happening or just happened call 999, if less urgent call 111. The cycle extravaganza in the cycle stadium went off well as far as residents were concerned and will be repeated next year. Residents learned that plans are being made to take advantage of the 400th anniversary of the death of Richard Burbage to mark what an exceptional Shakespearean actor he was. Following this year’s live concerts in Brockwell Park the Field Day and Love Box events are planned for 2019 and residents were alerted to the Brockwell Park feedback sessions at Gallery 198 on Tuesday 16 and Wed 17 October 2018. Turney Road will be resurfaced in November and Feedback can be given on the Quietway on the Southwark council website. Residents should inform Councillors Margy Newens and Richard Leeming as well. The main changes put in place, besides the new layout at the Dulwich Village traffic lights, are build outs replacing islands and a new pedestrian crossing near the junior school. There are proposals for new controlled parking zones (CPZ). Current CPZ proposals include adding Village Way to the North Dulwich triangle CPZ. The possibility of a CPZ in East Dulwich to include Townley Road. Also Croxted Road may have a CPZ. All these may impact Turney and Burbage. So a discussion was held about Turney and Burbage being included in any Village CPZ. It was noted that the Dulwich Society is likely to be setting up a public meeting to discuss a Village CPZ. Together both Turney and Burbage are proposing to run a survey to obtain some base data about parking in the roads. This will include finding the number of residents vehicles, the number of off street and on street parking places and information about the difficulties if any of parking at different times of the day. This idea was well received. Edward Allyen Club: residents are encouraged to use the Club as all were welcome. The bar opens 4-7.30pm most days and at the weekends. There is Space for 130, which can be used for parties and residents are given preferential rates. Dulwich Society: Sue Badman, recommended we look at the Dulwich Society website www.dulwichsociety.co. There are new digitalized maps of Dulwich Estate. Additionally, Dulwich Society is now giving grants for projects. Dulwich Estate Advisory Committee meets three times a year. Safe Routes to School: Ros Walton, Secretary to SRS, advised we all keep a look out for children who need support as muggings are often disguised to look like friendly chats using shielding body language. A concern was raised about the safety of the junction between the Dulwich Sports Club access road and Burbage for vehicles and pedestrians. This will be taken up with the club. JOINT AGMs TODAY SATURDAY 13 OCTOBER AT 10AM TIL 11.30. We hope residents can join us for the annual meeting of our Residents’ Association. This year we will hold the AGM jointly with Burbage Road. We have one of the most long-established, thriving and well-respected residents’ associations in Dulwich. For those of you who are new, or who have not had the opportunity to become involved, we represent our 200 households, including those in Roseway. We foster communication within the road and with other local organisations with the aims of preserving the utility of our environment, the security of homes and the safety of all those using our road and pavements whilst also supporting neighbourly help and socialising. There are no fees but we sometimes raise funds for specific purposes. You are welcome to join the Committee. Drivers in Southwark fined for leaving car engines running! Drivers in Southwark face spot fines for leaving engines running in the street as new research highlights the link between vehicle emissions and premature death. This will be a great benefit for Dulwich Village schools as well as others where busy roads pass by and drivers routinely keep their engines running when stationary. Drivers could be hit with £20 on-the-spot penalties for refusing to turn off engines when cars are stationary by the roadside. In some areas, residents are being asked to report motorists who leave engines running, including providing the registration number, colour and car model of repeat offenders. 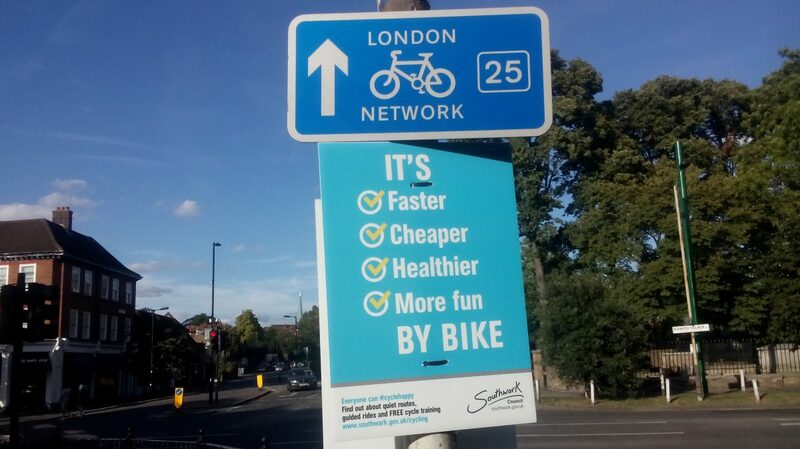 As well as Southwark, measures have been adopted by Norwich, Wirral, Reading and Camden. Research has found that people living near busy roads are at risk of developing dangerously swollen hearts. A study by King’s College London projecting the impact of vehicle emissions on life expectancy estimates that the measures to cut car use and promote more active lifestyles would lead to a reduction in nitrogen dioxide levels of up to 25 per cent between 2013 and 2020. Children born in 2013 would be expected to gain seven weeks of life as a result of the measures to cut car use and promote more active lifestyles. It is an offence under laws introduced in 1986 to leave a “vehicle engine running unnecessarily”. New powers were handed to councils under the road traffic regulations 2002 in England to issue fixed penalty notices of £20 if motorists refuse to turn off engines when asked by traffic wardens or police. It can increase to £40 if unpaid after 28 days. Similar powers were introduced in Scotland and Wales in 2003 but most councils have previously opted not to exercise them. According to the RAC, idling engines can produce emission levels twice as high as those in motion and it welcomes a focus on idling engines, expecting drivers to be fined if they failed to turn off. Westminster council in central London was one of the first to adopt the fines as part of a concerted campaign. Last year, the authority said that it wanted to get even tougher on drivers by issuing parking charge notices of £80 to those leaving engines running. Westminster allows people to report repeat offenders, using the authority website to log details of cars involved. Let’s hope it makes an improvement in Dulwich. Author zen148812Posted on Fri 3 Aug 2018 Thu 9 Aug 2018 Categories Environment, Health, Recent Posts, Road Safety, Schools and EducationLeave a comment on Drivers in Southwark fined for leaving car engines running! All three Dulwich Village schools have put up these powerful banners complaining about the loss of funds for education in the Village. Primary and Secondary schools are suffering a loss of considerable funds. It does not seem to be the time for cutting education capacity. Our children need to compete for further education and for jobs and our country needs to compete better in the world. For decades our education performance has lagged compared with other countries and continues to do so. We all know that good education is the key to success. The banners speak for themselves. Dulwich Village was long known for its healthy range of shops run by locals. Some can still remember that the Village once had a much wider range of shops. It was a destination for shoppers within Dulwich and beyond seeking a wide range of fresh food including fruit & vegetables and fresh meats. Many such locally run shops have gone. Only recently the last remaining grocer closed, causing great inconvenience to locals who depended on it. Higher and higher rents demanded by the Dulwich Estate landlord, attracted by high value tenants such as corporate chains and estate agents, have made it hard for neighbourhood shops to continue. In this environment, it is wonderful to see that our independent businesses are doing well and that they are strengthening by working together. They depend on us shopping with them. Enjoy this video about our Dulwich Village independent businesses. Longer term residents will be familiar with the two decade old debate and promises for the replacement of Dulwich Hospital with modern health services. Plans have come and gone and changed including public consultations and still nothing has appeared in the ground. However the impressive new buildings on the Dulwich hospital site are an indication that things really are moving – for a new Charter School. But nothing yet for health services. The local NHS has issued an update now saying that it has refined the list of services, in accordance with the results of the consultation, and calculated how many patients it needs the health centre to accommodate. That has helped it to determine how big the new building needs to be, and how big a site it needs to be built on. The new build will be on the south-east corner of the Dulwich Hospital site and has been approved by NHS England and NHS Property Services. The local NHS expects to start building in April 2018. The NHS will fund the building through a PFI (Private Finance Initiative) scheme funded through the NHS paying annual rent on the property for 25 years. Given the disastrous Carillion PFI contracts and the huge burden on NHS budgets caused by the high cost of PFI which has stressed the finances of the NHS across the country and contributed to the putting of Kings College Hospital into special financial measures, it is surprising that more such obligations are being taken on. The police report the following crimes in December and remind all residents to double lock our front doors when going out. They add that we should place all boxes that can show we have new TV’s /computers etc in bins not on display to attract burglars. 2/12/17 – Eynella Rd – Burglary – Overnight persons unknown have gained entry to shed. Nothing stolen. 2/12/17 – Eynella Rd – Burglary – Overnight bike stolen from rear garden shed. 18/11/17-2/12/17 – Theft from m/v – Gilkes Crescent – Catalytic converter stolen from vehicle. 5/12/17 – Turney Rd – Burglary – By suspects forcing front door of property and removing computer equipment. No deadlock activated. 4/12/17-7/12/17 Arnhem Way – Burglary – Unoccupied property. Entry gained via first floor bathroom window. Not known what stolen. 7/12/17 – Tarbert Rd – Robbery – 14 year old boy had mobile phone taken by older boys. 8/12/17 – Elphindale Rd – Theft of m/v – Vehicle stolen overnight by means unknown. Found in Barking, Essex. 11/12/17 – Townley Rd – Burglary – Between 0820 and 0930hrs suspects have entered via rear door. 11/12/17 – Wyneham Rd. Burglary x 2 – Between 1330 and 1445 hrs two flats entered via front door which appears to have been slipped. Once inside, front doors of flats forced and property stolen. 11/12/17 – Frankfurt Rd – Burglary – Front door forced. Coat taken from hallway. 7-11/12/17 – Druce Rd – Theft from m/v – Vehicle entered by means unknown and small change taken. 14/12/17 – Court Lane – Robbery – Schoolboy robbed of phone by older schoolboys. 14/12/17 – Dovercourt Rd – Theft of m/v – Sprinter van stolen overnight by means unknown. 15/12/17 – Court lane – Theft from m/v – Transit van broken into by four males. Witnessed by passing member of public. 16/12/17 – Eynella Rd – Robbery – Post office van stolen by means of robbery. 17/12/17 – 25/12/17 – Pickwick Rd – Theft from m/v – During times persons unknown have smashed window of vehicle and taken property. 29/12/17 – Attempted Burglary – Court Lane Gdns – Entry attempted via rear windows. Believed alarm scared intruders off. 30/12/17 – Burglary – Dovercourt Rd – At 1745hrs occupant heard loud bang and saw male running to rear door to escape. In January already in Turney Road there has been a theft of a car by breaking in the side window and taking the door and car keys handily left by the front door and escaping with the car – at about 5am. Consultants are looking at a Traffic Management Strategy across Dulwich. They have prepared an online page which includes a list of all proposals and a map to help localise them. Each proposal is presented with a short description and with the opportunity to leave a brief comment. Proposals are grouped under six wide themes (some of them fall within more than one theme): Air Quality, Walking, Public Transport Accessibility, Traffic Calming, Cycling, Parking. Please follow the link below and scroll to the bottom of the page to access the engagement page. The page will be available until 24th January 2018. Once the online engagement is complete they will analyse feedback and undertake the assessment of each of the options in line with the Healthy Streets approach and reflecting feedback from the community. Informed by the feedback analysis and the assessment, they will then draw together the proposals into a coherent plan. Together with other planned events, such as the Lambeth Country Show and the world Cycling Revival ( http://cyclingrevival.com ) this will form a virtually continuous stream of large scale outdoor events in this firmly residential area. The noise from existing events in this Park ( including an electronic music festival last summer) causes considerable upset as it carries across gardens and into homes, especially in the summer months when people are enjoying being outdoors most. The events include music into the late evening (11pm). Again this is entirely inappropriate for a residential area. Many children will be undertaking public exams and school work during the proposed June event. The increased pressure on parking in residential streets and public transport will be considerable. Local trade in the Herne Hill area will be adversely affected as locals stay away. Traders are already adversely affected by works around Herne Hill Station. The pressure on policing and safety will be unacceptable. Of particular concern are personal safety and drug availability. The disruption to roads during the setup, festival itself and clear up will put immense pressure on busy routes through Herne Hill, Brixton and Tulse Hill. The limitation on access to significant parts of this public amenity in the light spring and summer months for local families seems to be against the public interest, especially the young and those who do not have access to gardens or green spaces of their own. There have been about 35 recent mail thefts in our immediate area. These serious matters are being forwarded to Helen Hayes MP, to take up directly with the Police and Royal Mail on behalf of everyone who has suffered a loss. Victims should record their individual problem with Royal Mail Customer Service Dept. (customer.service.team@royalmail.com) and be given a reference number for the complaint. Whether or not the issue is now closed anyone affected is urged to take the time to email Helen Hayes MP at helen.hayes.mp@parliament.uk and report it all to her so she has a complete dossier. Those reporting back to her should include people who have missing statements, usually John Lewis credit card statements, as this has been the precursor in some instances, to having a card issued to a third party, to the account name. Make it clear you have not suffered a loss at this time but have told JLP a statement is missing. Your email should be headed Royal Mail in the subject line. You should then give your full name, address and the customer complaint number given you when you reported the loss. If for some reason you did not report this to Royal Mail would you please still report what happened to your post/credit cards/bank loss to Helen so that she has a full picture of the situation in our pretty small area. https://www.noddle.co.uk/ free credit check and will identify any fraudulent opened bank accounts / credit cards et al. Many have done this and it is free and reassuring to see at a glance if there has been illegal activity. Ask your bank to text you when they post a new card or cheque book to you. Ask your bank if they can issue you with a telephone banking pass number. This will mean they don’t have to rely on common security questions eg date of birth, mother’s maiden name which may have been hacked from a third party or available from something like the Electoral Register. This year St Christopher’s Hospice is celebrating the 50th year since Dame Cicely Saunders opened the hospice at Sydenham. So beginning the hospice movement, now with over 200 hospices in the UK and 500 worldwide. Her work focused on the trilogy of care, education and research. In the last few years the wards have been completely refurbished and the communal areas of the hospice. To recognise this major milestone the hospice has decided to focus on the learning aspect of her trilogy. It has opened a special Capital Campaign to focus on building a new world class Centre of Learning. Here the hospice will develop its educational programme to train many more people to care for the dying, and to develop the most effective ways to help individuals and their families at the end of their lives. St Christopher’s is probably the biggest provider of training and learning for end of life care (EoLC) in the world. But there is so much more to be done. This new centre will not only train many more professionals, but also offer opportunities to families, friends, and carers to develop the skills and confidence they need to care for their loved ones at home. This learning will not only be face-to-face, but will utilise all the advantages of the internet to widen access nationally and internationally. Our neighbour, Dr Tyrrell Evans, has been a Trustee of the hospice for many years until very recently, and he would like to invite friends and neighbours in Burbage Road to an Information evening about the plans for the Learning Hub and the future of the hospice at his home on Sunday January 14th between 5-7pm. Refreshments will be provided. Anyone interested and able to come that evening should email him at tyrrellevans@doctors.org.uk. If you cannot make this date but would like to learn more about the Campaign please let him know so he can arrange an alternative opportunity for you. Residents of Burbage Road have received notice of the Resident’s Association Annual General Meeting and they are all urged to make some time to come along on Saturday from 10-12am. The issues raised by residents over the last year will be reviewed and priorities for next year agreed. In the last 12 months traffic, parking, burglary and other crimes, tennis courts, mental health & well-being, relations with the sports clubs and noise have been among the many issues dealt with on behalf of residents by the committee. New recruits to the committee are ALWAYS welcome. The AGM will also learn more about the history of Burbage Road in a talk by Brian Green on how farms became the sports clubs. If you are new to Burbage Road, you will be pleased to know that the BRRA is one of the most long-established, thriving and well respected residents’ associations in Dulwich. We represent our 200 households, including those in Courtmead, Donne Court, Royston and Cobb Courts. We foster communication within the road and with other local organisations with the aims of preserving the utility of our environment, the security of homes and the safety of all those using our road and pavements whilst also supporting neighbourly help and socialising. James Freeman, the Club Manager has been picking local blackberries to make homemade blackberry gin for the welcome cocktails. Micky the magician will be performing at 6.30pm for the youngsters and local legend, Amanda Greatorex will be at the turntables for a family disco as dusk falls. Bring a light picnic or take advantage of the pay BBQ. Tickets are being sold door to door currently. Please support us if you possibly can: £15 for family (extended family most welcome) or £10 for couples and £5 for singles. Nelly’s Nursery have kindly funded children’s dance prizes and entertainment and Pedder Properties have also continued their support with the complimentary welcome cocktails. We’re really grateful to them both. What changes are being made to the Village Junction? This week the council’s contractors have started on the long-planned changes to the layout of the Dulwich Village crossroads. Many changes have been made to the junction over the years to try to accommodate the many pedestrians, cyclists, motor cyclists, lorries, vans, coaches, buses and cars which use it. The junction is on a popular road route in and out of the centre of London and for traffic going east/west across south London. By and large it is a manageable junction – until school term starts. Then thousands of schoolchildren and their cars, cycles and coaches converge and join in the morning and evening rush. Changes made in the past to enable the mixed traffic to move more easily have included changing the phasing of the traffic lights, lengthening the time allowed for pedestrians to enter the junction, changing road traffic priorities (several times}, narrowing the entry to Calton Avenue, building a road platform on Court Lane entry, inserting bollards. Changes to Calton Avenue and Turney Road will follow in 2018. Author zen148812Posted on Thu 24 Aug 2017 Categories Community Safety, Cycling, Parking, Recent Posts, Road Safety1 Comment on What changes are being made to the Village Junction? Residents have received a letter through their doors saying works to install the Quietway will start next Monday 7 August. This came as a surprise as the Council has not yet decided to proceed with the Quietway. Council officers have made their final proposals and it is expected that just a rubber-stamp formal decision will be made, as we were previously told, by 27 July by the relevant Councillor. That decision has not been made, so maybe there are further thoughts being had at the Town Hall. Maybe Cllr Wingfield whose responsibility it is to make the final decision is having doubts. Or perhaps he has just been too busy on a host of other matters which have taken precedence. It seems the letters to residents have come out too quickly and before the decision has been made. Village Councillor Jane Lyons tells us she expects a decision TOMORROW and that the works will NOT start on Monday! Author zen148812Posted on Tue 1 Aug 2017 Categories air quality, Community Safety, Cycling, Environment, Health, Local shops and restaurants, Parking, Planning Issues, Recent Posts, Road Safety1 Comment on Quietway – delayed?? Southwark Council planners want to move ahead now with the Quietway from Elephant & Castle to Crystal Palace through Dulwich Village. Dulwich residents were active in raising objections to the Quietway Scheme and discussions have been continuing with the Council. Southwark’s planners are now recommending that the scheme proceed. Shortly, Cllr Wingfield, the responsible Southwark Councillor, will decide whether to accept the recommendations. Depending on the decision Cllr Wingfield makes and the reasons he gives for his decision there will be a few days to decide whether the Councillors on the Overview & Scrutiny Committee should be invited to challenge that decision and recommend ways he can improve it. Once Cllr Wingfield’s decision is made public our local councillors will want to hear residents’ views before determining whether they should call the decision in for scrutiny by Southwark Council’s Overview and Scrutiny Committee. The decision will be made by Thursday 27th July and call ins must happen within five days thereafter. It looks like the Government’s cuts to our schools in Turney Road are going ahead. This poster on Turney Road School announces a ‘Carnival Against the Cuts’ on Sunday 16 July. This seems a strange time to be reducing education provision with rising school roles and a need for the country to become more productive and efficient. Our schools are taking the plans seriously and are every worried. John Fraser – MP and community champion. We shall miss him. John Fraser passed away on 6 April. He was an active member of the Turney Road Residents’ Association and a welcoming and friendly face to any new residents in Turney Road. and worked diligently to let everyone personally know of consultations on local changes such as the Quietway, parking, playing fields, street greening and improving our local environment. John was a keen runner, regularly spotted pounding local streets and parks. He put his running to good use in leafleting residents and encouraging residents to sign up to the residents’ association. He was a keen gardener and enjoyed opera immensely. He was always keen to chat about the flowers, trees and wildlife species in his beloved garden with a fondness for hedgehogs and maintaining wildlife habitats. John was a solicitor by training and worked as a senior partner at the law firm Lewis Silkin LLP. Had had a long and active political career from when he was a councillor on Lambeth Borough Council from 1962 and the London Borough of Lambeth from 1964 to Parliament. John was the Labour Member of Parliament for Norwood for more than thirty years from 1966 until 1997. His sharp mind and excellent people skills led to him being appointed Under Secretary at the Department of Trade and Industry in 1966, Under Secretary of State for Employment in 1974-1976, and Minister of State at the Department of Prices and Consumer Protection from 1976-1979. He was a much loved and respected local MP, taking pride in diligently representing and serving the local community in which he lived and brought up his family. He had extraordinary language skills and was able to greet constituents in almost all of the many languages spoken in the rich and diverse constituency he served. One resident remembers being impressed by John’s language skills when he made a point of telling her that it was vital to greet constituents in their native language as he tried to teach her Yoruba at one of the Turney Road parties. After standing down as an MP, John continued to play a very active role within the local Dulwich and West Norwood constituency Labour party, knocking on doors and leafleting year round. He played a full part in the life of his local Labour party branch, the General Committee and Executive Committee; and within the local community, continuing to support local advice charity Centre 70 which he helped to found in 1970. John was married to Ann and together they had three children, five grandchildren and two great-grandchildren. He will be greatly missed by his family and friends, the local Labour Party, the Turney Road and Norwood communities and the wider Labour movement. He was our street champion in every sense. Author zen148812Posted on Sat 15 Apr 2017 Mon 24 Apr 2017 Categories Recent PostsLeave a comment on John Fraser – MP and community champion. We shall miss him. The Dulwich Gallery wants to erect a Pavilion in its grounds for the summer and has applied to the Council for permission. It also wants a licence for alcohol and late operating. It is the 200th Anniversary of the Gallery so of course they want to celebrate. However, the amenity of residents will be affected in one way or another and particularly in Edward Alleyn House, Woodyard Lane (who heard the outdoor Belair House and Park Cinema noise on summer evenings in the past), College Gardens and College Road as well as Turney and Burbage Roads. The Pavilion is temporary but there is no date for its removal and if it is a commercial success it could reappear next year or remain in place. The Gallery is understood to be looking for business hirers for summer parties. This is in addition to events such as weddings which are regularly held there. Included in the Gallery’s application to the council is cinema, dance, live and recorded music, a bar and other events. The Gallery does not say how frequently it plans to hold these events except that the application covers the months of June, July and August, every weekend and every evening in the week. The Pavilion has no insulation against noise and neither would a marquee. There are precedents locally – Edward Alleyn Club and the Velodrome – where there have been successful negotiations with residents about events impinging on them. This is what the Gallery should consider in this instance, particularly if strong feelings develop about its proposals. The Gallery should have approached residents in advance of its application to the council. As it has not done so, now is the time to tell the council and the councillors. If a resident is happy with the plans there is no need to do anything. Dulwich Hamlet Junior School in the centre of Dulwich Village had these signs and placards attached to its railings this morning. The Government is cutting funding for schools in London. According to the Institute for Fiscal Studies (IFS), the funding cuts particularly hit inner London schools. Already facing cash cuts of 2.5% per pupil before 2020, the further cuts amount to a 7% reduction for many schools. The Dulwich Village primary schools are popular with our families. Cutting their funds as we embark on new competitive world relationships is counter what would be expected. MPs have launched a “super inquiry” into Britain’s toxic air scandal to force the Government to dramatically step up action to tackle the health threat to millions of people. In an unprecedented move, four Commons committees are to grill ministers and air quality experts on the dangers from filthy air in London and other cities. The hearings by the health committee, transport committee, environmental audit committee and environment, food and rural affairs committee will be held as the Government draws up its latest plans to deal with toxic air. Labour MP Mary Creagh, who chairs the environmental audit committee, said: “Ministers will face unprecedented scrutiny in Parliament to ensure they finally step up to the mark to ensure adults, and children in particular, do not have their health damaged by filthy air. Ministers have been forced to draw up new proposals to cut air pollution after judges backed environmental lawyers ClientEarth in two high-profile cases that the Government was failing to do enough to reduce nitrogen dioxide levels. The draft new plans are due to be published on April 24 and the MPs want to ensure they not only meet legal requirements but also deliver maximum health and environmental benefits. We may think of kerbsides as just space on the public highway next to the pavement. But they are more than that. Kerbsides include footpaths by the kerb and which might be widened for tree planting and street seating. They include the white posts and green verges we love in Dulwich. There is great competition for the kerbsides from vehicles, cyclists, pedestrians, house occupants, push-chairs, etc. etc. We know only too well how busy our kerbsides are at times and how they are hazardous for the unwary, the reckless and those of us who are a unsteady because of age, youth or illness. Demographic Pressure: The population is growing faster in Southwark than expected. At the last census in 2011 it was 288,000 and today is estimated to be 306,000. The government forecasts it will be 370,000 by 2031, an increase of 82,000 or 28% in 20 years! Parking: 60% of Southwark households don’t own a vehicle, yet parking in the borough takes up an increasing amount of kerbside space. In our streets, however, many households own multiple cars and large ones at that. Parking is the issue which sparks greatest interest in our streets. There has to be an improvement in access to and usage of public transport. Road Safety and the Environment: The Council wants to improve the lives of older residents and to enable them to live independently for longer. Older people typically drive less and favour public transport. There are increasing numbers of older people in Southwark. There is a demand for wider footpaths, more frequent and safer pedestrian crossings, accessible bus stops and uncluttered, pleasant neighbourhood centres to sit and relax in. Traffic Collisions: More people walking or cycling in Southwark are killed or injured than in any other mode of transport. Road traffic accidents are increasing each year. In 2015 there were over 1,000 in Southwark with 90 fatal ones. Air quality: According to the 2015 King’s College University report, up to 9,500 deaths in London each year can be linked to air pollution. Southwark’s road transport emissions are amongst the highest in London. There are a number of sites that exceed legal levels of NO2 (Southwark Air Quality Action Plan, 2013). At peak traffic periods, Dulwich Village experiences poor air quality, right by the primary schools. There are many competing demands which we are making and are set out in the Council’s draft strategy. The council wants our views. The consultation period on Southwark’s Kerbside Strategy has just started and closes on 28 April. Do you live in Herne Hill or Dulwich?? This may come across as a curious question and you may wonder whether it matters. It is a question that is troubling some locals as they are being asked to decide one or the other. This all comes about because the Government is insisting that local neighbourhoods are defined and that they are to have neighbourhood plans setting local guidelines and policies. Government guidance explains what factors need to be considered in drawing up a boundary for neighbourhoods but the main point about being in one area or another is money. Neighbourhoods with approved plans are entitled to twice the amount of money from Community Infrastructure Levy (CIL) than if there were no plan. The sum of money is unknown. It may not be much – especially if there is little development. Each borough has its own CIL policy. Herne Hill is shared between Lambeth and Southwark councils. The Herne Hill Forum has been around for over 10 years and is busy identifying its neighbourhood boundaries. Members of the Dulwich Village Forum are trying to do the same for the Dulwich neighbourhood. Thankfully they are talking to each other so a sensible outcome is likely. Current proposals would put the Lambeth part of Turney Road in Herne Hill neighbourhood and the rest in Dulwich. The boundary between Herne Hill & Dulwich in Burbage Road appears to be moving, as discussions take place, from an earlier proposal for the railway viaduct to the junction with Turney Road. The Herne Hill Velodrome wants to be included in the Herne Hill neighbourhood, not in Dulwich. If all this seems confusing or you’re asking ‘what does it matter?’ more will come clear as the discussions become more and more public…..we hope! Do let us know your views. Author zen148812Posted on Wed 1 Mar 2017 Wed 1 Mar 2017 Categories Community Associations & Southwark & Lambeth Councils, Planning Issues, Recent PostsLeave a comment on Do you live in Herne Hill or Dulwich?? We’ve all noticed the large vehicles in the road and the many works vehicles blocking the pavements and road under the bridge – also the clearing of the undergrowth which was reaching out onto the pavement from the network Rail site. We’ve wondered why the sudden concern for the maintenance of the site. The answer is in the following letter from Network Rail. The Herne Hill Velodrome Trust is seeking new trustees and is particularly keen to see applicants from the local community. After rescuing the famous velodrome from dereliction and threat of closure, some trustees are retiring and the team needs strengthening. The Trust has done a fantastic job. As well as a new track which is increasingly heavily used by both top cyclists and locals including children, a new Pavilion will open soon. Herne Hill Velodrome Trust is a charitable and not for profit trust which maintains and develops the Herne Hill Velodrome on Burbage Road as a sustainable and vibrant community-based facility for healthy recreation, principally, but not limited to, track cycling and mountain biking, accessible to users of all ages, capabilities and abilities from a wide and diverse range of backgrounds. The Trust is looking for additional Trustees as it moves to take responsibility for the operation of the site now the new pavilion is nearing completion. All Trustees share collective responsibility for delivering the objects of the Trust, working in line with the requirements of the Charity Commission. The Trust will operate through two bodies – a Trading Company, to oversee the operation of the Track, and a Fundraising Committee to plan a long-term and sustainable financial future for the site. The Trust is looking for local residents to join the Trust. it needs people with significant relevant skills, in particular in the operation of a charitable Trust and in fundraising. More details about the Velodrome are available at www.hernehillvelodrome.com. Link Age Southwark wants YOU!! Link Age Southwark is recruiting new volunteers to organise social activities for over-60s in Southwark. The charity, which has been based in East Dulwich for 23 years, offers activity groups, befriending visits, transport to social activities and light DIY help around the home and garden for older residents of Southwark. All services are volunteer-led and the charity is always looking for new volunteers to help older residents maintain their social life and prevent isolation. If you would like to find out more about volunteering with Link Age Southwark, please call 020 8299 2623, email volunteering@linkagesouthwark.org or look at www.linkagesouthwark.org Link Age Southwark has volunteers of all ages, ranging from 18 to 91! Author zen148812Posted on Wed 15 Feb 2017 Categories Community Associations & Southwark & Lambeth Councils, Recent PostsLeave a comment on Link Age Southwark wants YOU!! Front garden layouts are a bugbear of Turney Road – ugly with so many unsightly car parks standing brutally in front of our fine Edwardian houses. However with the influx of new residents paying high prices for their homes and investing even more into them, there has been a welcome increased resident acknowledgement that frontages are detracting from their homes and from the street. In response the Scheme of Management has provided an example front garden layout for the houses in Turney Road, that are unable to comply with the Scheme of Management Guidelines for Hardstandings due to the small size of the front garden. The example drawing is below and more information is on its website. They form the basis of the Manager’s approach to an application to redesign a front garden. Any queries should be referred to Nina Rees at the Scheme of Management office. Where residents intend to park a car on a forecourt they will need to apply to Southwark Council for permission to create a new entry into the highway – from the forecourt into the road. The Council can give approval under planning and highways legislation to create a new kerb crossover onto the road. The crossover is recognised by its ‘dropped’ kerb edge. An area of high pressure over the UK is resulting in calm, settled and cold conditions and poor dispersal of local pollutants. Thursday is forecast to be slightly less cold with winds picking up a little which should lead to the currently elevated pollution levels clearing during the day. However, another cold night tonight with light winds is likely to result in further ‘moderate’ nitrogen dioxide at busy London roadsides on Thursday morning before conditions start to improve. There is also a chance of further ‘high’ and ‘moderate’ PM10 and PM2.5 if pollution is slow to clear. Friday, early mist and fog will slowly clear to leave a mainly cloudy day with the possibility of patchy light rain in the east later. Even lighter winds than of late, and the early mist will likely cause another day of pollution build-up, escalated by the already elevated pollution levels. Consequently, ‘Moderate’ levels of nitrogen dioxide are expected to occur close to busy road locations. Furthermore, air will begin to arrive from the North-East later in the day and may import some polluted air as it passes near to industrialized areas of Western Europe. This incoming air will add to London’s local pollution burden and is likely to result in ‘Moderate’ levels of PM10 and PM2.5 particulates. The TRRA held its Annual General Meeting on 21 September and will continuing informing residents of issues of interest and liaising with neighbours in Burbage Road and the Village. The Association maintains a regularly updated email list of residents and will use this to alert residents and to respond to enquiries from residents and local organisations. The meeting was attended by our three local councillors from Southwark and Lambeth who give us a great deal of help. Issues discussed included: Crown & Greyhound pub, parking congestion, air quality, SG Smith development site, Quietway, Neighbourhood Planning, lease renewal option for SCST Sport Ground, crime, velodrome, road safety & the decline of wildlife. At this week’s Dulwich Community Council (DCC) the meeting chair read out the following statement regarding Quietway 7. “The cabinet member requested officers, following feedback at the last community council meeting, to reconsider various aspects of the design and related issues. In particular officers were asked to conclude the Foundation Schools Coach service study (working in partnership with the Foundation schools) and this work has now been completed and an action plan around the high priority issues has been developed. It is expected that this will lead to significant improvements in the impact of the service on the local community, including the removal of 10 of 11 coaches from Calton Avenue each morning and significantly less coach congestion on Townley Road in the afternoon. Author zen148812Posted on Fri 30 Sep 2016 Categories air quality, Cycling, Environment, Parking, Recent Posts, Road SafetyLeave a comment on Quietway – breaking news! Dulwich’s New Health Centre is being built – hooray!! The new Dulwich Health Centre will definitely be built after decades of delays. The traditional ground-breaking ceremony was carried out on Friday 20 July by the Mayor of Southwark, Councillor Catherine Rose and Dulwich and West Norwood MP Helen Hayes. The health centre will cost £16.8 million and will provide primary care, children’s service, diagnostics, physiotherapy, renal dialysis and community mental health services. A new health centre was first proposed some 30 years ago to replace the very old red-brick Dulwich hospital and has gone through several potential versions There has been a lot of consultation with the people of Dulwich during which there has been tough questioning over the use of the original buildings and whether they would be retained. The old Dulwich Hospital, where many local residents have been treated and had their babies, is a sad shadow of its former self and now houses a limited number of NHS services including the blood test unit and the out-of-hours GP service. The new school shares the site and is appearing quickly. The new Health Centre will follow right behind. Author zen148812Posted on Tue 31 Jul 2018 Thu 9 Aug 2018 Categories Health, Recent PostsLeave a comment on Dulwich’s New Health Centre is being built – hooray! !